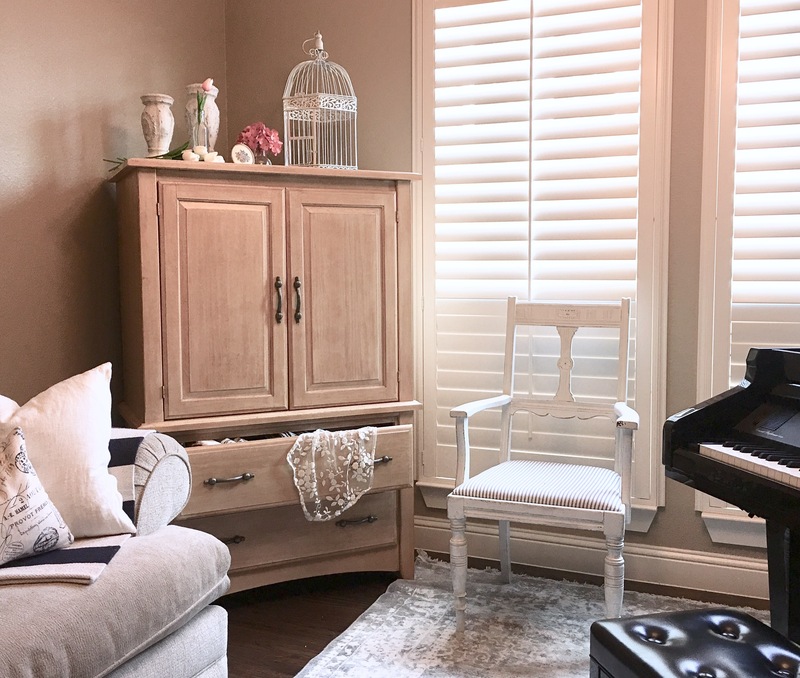 It’s so easy to look at a piece of furniture that was designed for one thing and not be able to see another purpose for it. Take the TV armoire for example. Back when we all had big box TV’s, this piece of furniture was incredibly popular because you could load your TV and VCR combo player, and stack all the boxy movies on the shelves or drawers, and close the doors to hide it all! So now that technology has given us the ever expanding flat screen TV, entertainment centers have become buffet-type cabinets meant to go under the flat screen. And now there’s a surprising surplus of old TV armoires! I’m not kidding! Run to your local thrift store and see for yourself! 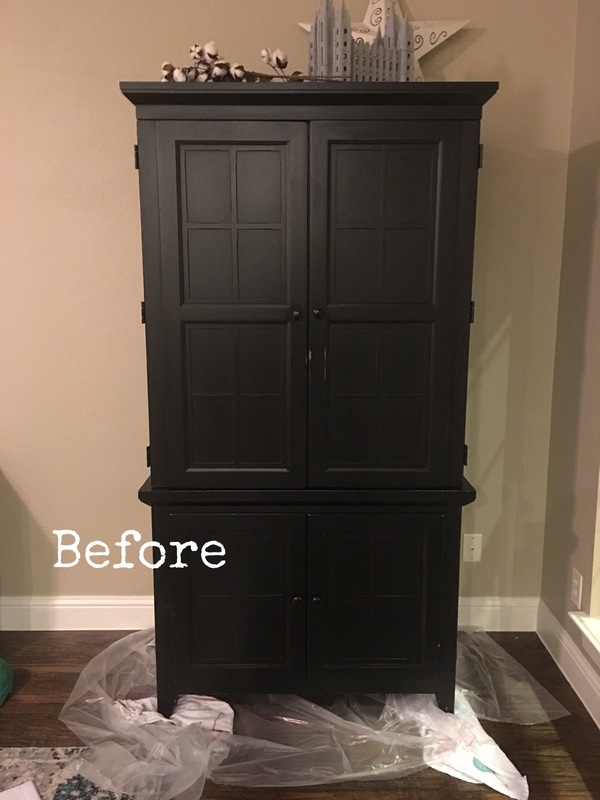 There’s actually quite a lot you can do with an old TV armoire! At their core, they are pieces of furniture designed to be a storage solution. And with a little creativity, they still can be! I have two old TV armoires! We purchased one for the TV in our bedroom years ago, and I use it now for blankets, sheets and table linens! It sits here as a decorative piece in my living room! My 2nd armoire was given to me by a dear friend who needed it gone! I was thrilled! I’m using it for my office station to store all of the binders, books, bills and school paperwork that tends to clutter my counters. I also keep our laptop and charging dock there. In fact the holes in the back of the armoire create an excellent place to hide the charging cables! When my friend’s home flooded a few years ago, this piece sat in 4” of water. It’s MDF legs swelled up and the paint cracked off. The insurance appraiser said it couldn’t be fixed, and he’s right. There is no good way to repair MDF. Since the legs are still structurally sound, I painted and distressed the area. It’s unoticeable with it’s coat of new white paint. 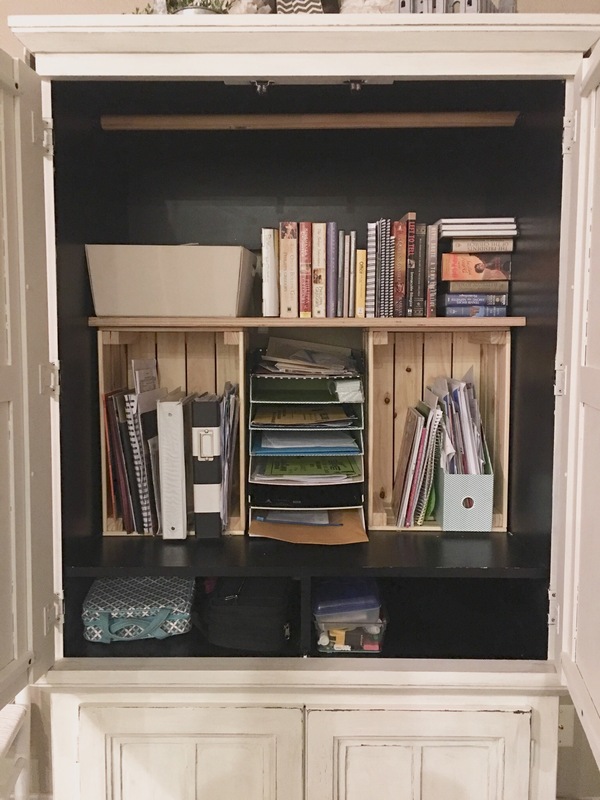 To create more organized storage, I found crates at IKEA and used them to create some shelving. The paper organizer is from Target and there is one for each child’s school papers. When I have more time I may build legitimate shelves for this spot, but this is working great for now. I cut a board to go on top of the crates to create another shelf! All of this new shelving hides the cardboard backing piece that has a large hole in it. Eventually, I’ll attach a new piece of thin plywood there and cover it with wallpaper. 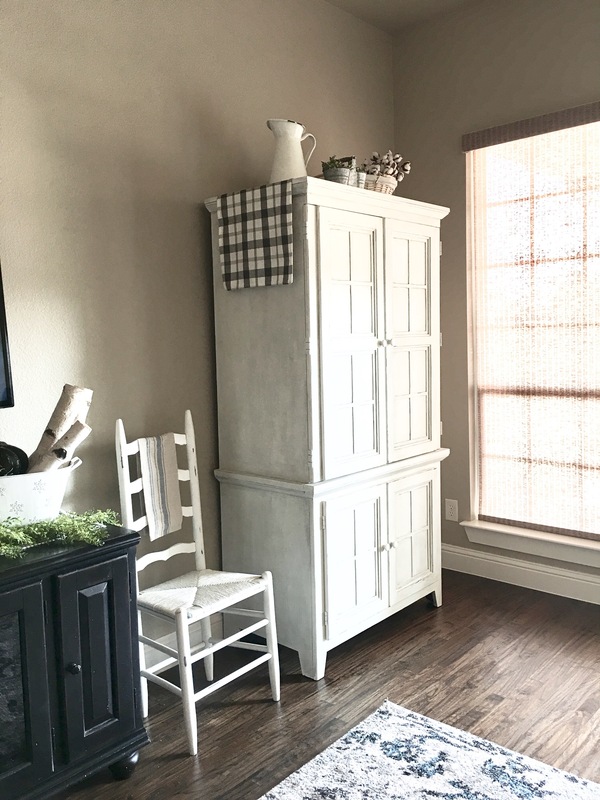 Here’s another brilliant idea: my friend installed a rod at the top of this armoire so she could use this piece to hang all of her table cloths. 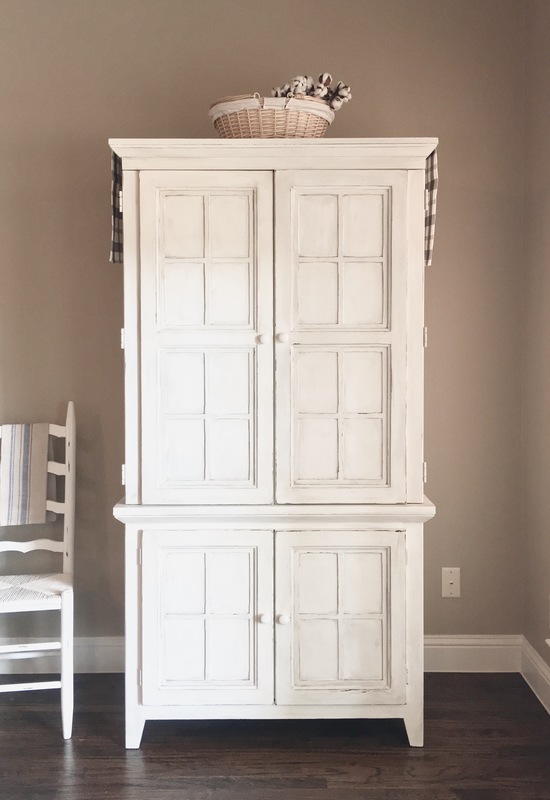 Just think, with a curtain rod in an old TV armoire, the piece could be used as a true closet for clothes! My favorite part about armoires is that they provide a beautiful way to hide the mass quantities of stuff we have! We have a lot of people in our home, and there’s just a lot of stuff that goes along with it ! I absolutely love being able to close these doors and hide the clutter. Your turn to share! What ideas have you seen for old armoires?